During law school, I was fortunate enough to do research for prominent antitrust scholar Einer Elhauge during my time at Harvard Law School. That interest carried over to my clerkship in Minneapolis for Judge Loken on the Eighth Circuit. During the early months of my clerkship, I would often spend my weekend mornings drinking Chocolate Steamers at Dunn Brothers in downtown Minneapolis, reading books on various subjects. One of them was Robert Bork’s, “The Antitrust Paradox.” As someone with great interest in law and economics, Bork’s book had a strong early influence on my own antitrust perspectives. Along with my work for Professor Elhauge, it also contributed to my interest in practicing antitrust. (A picture of my copy “The Antitrust Paradox” is above). This most recent issue of the Antitrust Law Journal celebrating Robert Bork’s contribution to antitrust is particularly timely, as the European Parliament passed a non-binding resolution to break-up Google. This action, along with antipathy in Europe and elsewhere toward other technology companies like Facebook and Amazon, present a strong test of the idea that the purpose of antitrust law, including EU competition law, is to protect competition, not to pursue other political ends. It appears that these political actions and calls for action are less concerned about whether, economically-speaking, Google and other companies are abusing dominant or monopoly power, and more concerned with weakening strong influential companies. 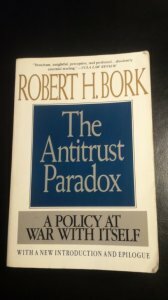 Before Bork’s contribution, this approach was not uncommon and the antitrust world wasn’t aligned with how to deal with it. There is plenty to debate about antitrust. 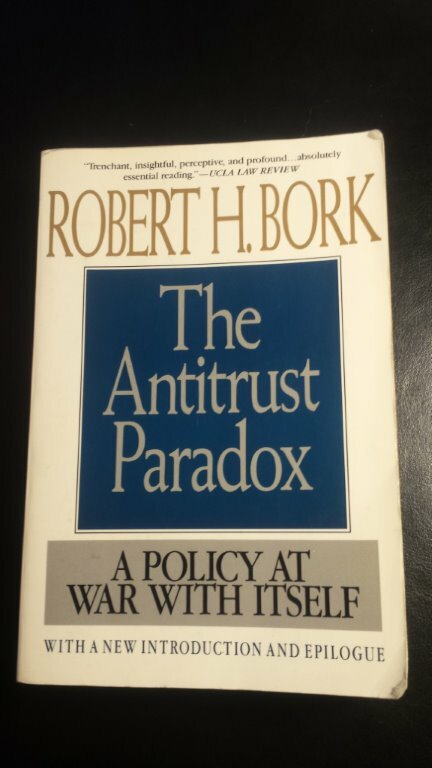 But, thanks in part to Robert Bork’s contribution, most antitrust actors agree that taking antitrust action against conduct or companies that are not harming competition itself is wrong.